Review Fix chats with Vestibule guitarist and singer Hector Gundlach, who discusses the band, their influences and goals for the future. Review Fix: How did this journey begin? How did you guys get together? Hector Gundlach: I guess the journey began at different places for all of us. Life has a strange way of putting people on the same path when they are truly passionate about whatever it is they are passionate about. For me, it started when I was born. I have a very musically talented family, and music is an everyday part of our lives. 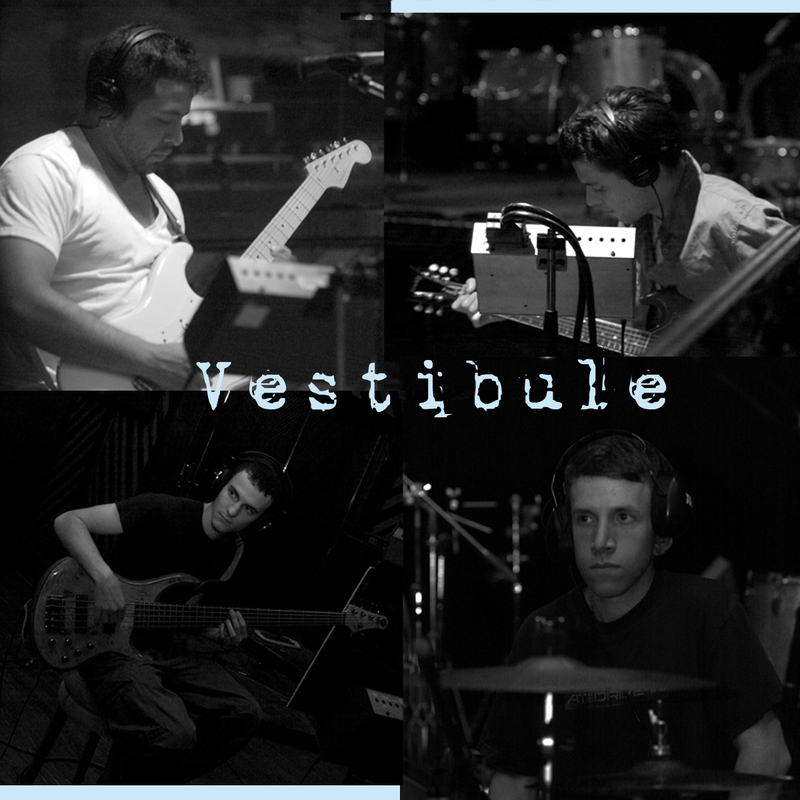 As far as Vestibule getting together… I’ve been trying to get Vestibule together before I even knew my band mates existed! After years of me being in many failed bands, Greg Harvilla (our drummer) randomly found me on facebook (or myspace… I can’t remember) and asked me to jam out with him and some other cats. That was in fall of 2007. I would say that is where it all started for us. Cody McCory and Adam DeRose (bass and lead guitar respectively) came onboard by April of 2008 after having a bunch of different people play with us. Greg and I have known Adam for quite some time, and Cody knew some of the other guys we jammed with, and we all just clicked. It was awesome. Review Fix: What are your influences? Gundlach: We all have a bunch of different influences… I’m sure people can hear that on the album haha. Cody is a straight Jazz cat, and likes pushing the boundaries. Adam is into all sorts of prog rock and hard rock. Greg listens to everything from world music to At the Drive-in. The first songs I ever remember loving were “Hotel California” by the Eagles and “Old time Rock and Roll” by Bob Seger (my mom used to blast those in the car all the time)… As a band I would say we are collectively influenced by a few different groups though… Pink Floyd, Incubus, Radiohead, Foo Fighters, Coheed and Cambria are the main ones that come to mind. We are also heavily influenced by each other. It’s a great band dynamic when we all tap into the same vibe. Review Fix: Astray is a pretty interesting song? What was the creative process behind it? How was it written? Gundlach: Cody actually came up with the verse/chorus/bridge parts and brought it to the table one day. Greg and I both worked on the lyrics, and the song itself was only those three parts for a while… After months of playing it that way, I felt like it needed something more to complete the song and I wrote the last section. They guys liked it and added to it and boom it was complete… We wanted the first bridge to completely contrast the whole song so we made it very ambient (pulled ideas from Radiohead) as opposed to the heavy punk sound of the rest of the track. As far as the second bridge… We wanted to have a cool build up and an industrial-like sound, so the guys wrote that cool staccato bass/lead guitar combo. The lyrics themselves are about a kid with tons of potential that just doesn’t have the heart to do anything with it. Review Fix: What are your live performances like? Gundlach: At first we just played the songs straight through… Now we’re starting to change them up for our performances. It keeps it interesting for us, and I feel like it keeps the audience on their toes. I’d say our shows are high-energy shows. Review Fix: What do you guys feel you need to do to reach the heights you think the band should attain? Gundlach: Well… It comes down to working our asses off. Play shows, save the money we make for a tour. Make money on tour and save it for the next album. Attract press and keep doing interviews… It will all slowly add up. The album has been getting a lot of attention, so I think we will be talking to labels within the next few months. We’ve also been working on tons of new music (which is also important for us to get to where we are going). Review Fix: What’s the band’s strongest point? Gundlach: We aren’t scared to be different and push boundaries. Review Fix: What makes you guys different from every other rock band out there? Gundlach: We like throwing different genres together and writing meaningful lyrics over the music. I think it gives us a kind of “theatrical” vibe. Review Fix: What are some of your guilty pleasure favorites? Gundlach: I love electronica music. I love to dance and club it up. Review Fix: What can we expect from you guys moving forward? Gundlach: I’m really excited about our new songs… I think we’ve matured a whole lot since we first started writing for the first album. We are looking for a producer for the next album (we did all the production ourselves on this one and it definitely sounds like it). Review Fix: How do you want to be remembered? Gundlach: As the band that changed things for our era.